The nation's top healthcare leaders overwhelmingly back the Affordable Care Act and support its goal of pushing providers away from fee-for-service medicine and toward delivering value-based care, according to Modern Healthcare's second-quarter CEO Power Panel poll. The overwhelming message from the survey, which covered a range of issues raised on the campaign trail this year, was that the next president and Congress should stay the course set by President Barack Obama and the ACA. But healthcare leaders are also looking for the nation's political leadership to reject complacency and look for ways to improve what they see as a far-from- perfect piece of legislation. More than two-thirds of the CEOs declared outright that they opposed repealing and replacing the ACA, and nearly all the rest said it depends on how that might be done. Only 2.3% of respondents endorsed that approach. While only 34.9% of respondents said they wanted to expand the ACA to achieve universal coverage, which has been central to Democratic presidential candidate Hillary Clinton's health policy proposals, half of all respondents said they were open to the idea but wanted to see more details. When asked about creating a single-payer system such as an expanded and enhanced Medicare program in place of private insurance, less than 10% supported the idea and 61.6% flatly rejected it. The rest said it depended on the details. In a finding that should sit well with CMS officials, the survey revealed overwhelming support for a continued push for value-based payment, accountable care organizations and the use of quality measures included in the ACA. Nearly 84% of CEOs said they did not want efforts to transform the delivery system to go away. “I hope (it stays) because I think it aligns our financial interests with our patients' interests in a better way than the current model, for certain,” said Dr. Penny Wheeler, president and CEO of Allina Health in Minneapolis. “So I do see it staying just from a practical standpoint, and I do hope it stays and expands from a mission perspective." Prescription drug spending rose 12.6% in 2014, and prices for many generic drugs have been rising faster than inflation. A Vermont bill that requires pharmaceutical companies to explain their price increases is expected to be the first of its kind to be enacted. At least five other states have considered such legislation. 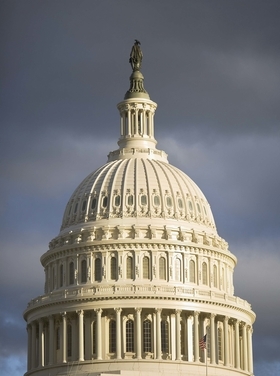 Healthcare leaders proved politically agnostic when it came to proposed changes to Medicare and Medicaid, backing Republican approaches for the former and Democratic stances on the latter. A little more than half of respondents said elected leaders should begin addressing the long-term financial needs of Medicare, the nation's program for caring for the elderly and disabled, by raising the eligibility age to 67. Half of survey respondents said they would like to see expanding means testing within the program. And a plurality backed moving to a universal Medicare Advantage system with premium support for seniors, an overhaul pushed by House Speaker Paul Ryan and other Republicans for many years. While the 28.2% in favor of the idea was greater than the 20% who were opposed, 48.2% wanted more details before they could back such a dramatic change in the program. Those worries about the financial stability of the program led just under half the respondents to reject gradually expanding Medicare to cover everyone over age 55 who doesn't have private insurance, a proposal Clinton championed on the campaign trail this month. Only 21.4% backed the idea and another 28.6% wanted more details. 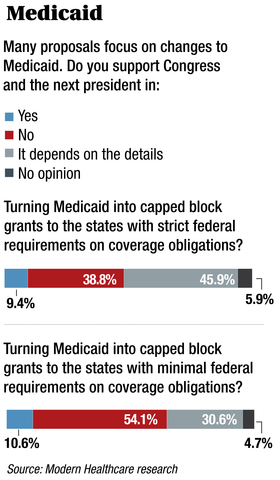 Some of the ideas put forward by ACA opponents received at least moderate approval in the poll. Nearly 75% said they would like to see expanded use of health savings accounts. But less than half were fans of high-risk pools and about 52% supported allowing health insurance to be sold across state lines.